Most of the people I work with are interested in living a life more closely connected to the Divine and spiritual light, and of course opening their spiritual gifts and psychic abilities. A perfect first step on this path is to get familiar with the function and workings of your third eye chakra. As the sixth of your seven chakras within your physical body, the third eye governs your potential for spiritual awareness. As the gatekeeper of your spiritual potential, it’s essential that you give time to clearing and balancing this chakra. Located on your forehead between your eyes, this energy center is connected to your ability to trust yourself, your intuition, and your ability to integrate your mental, emotional, spiritual, and physical bodies to each other and to this world. If your aim is to prepare for the next level of spiritual evolution, your third eye chakra will be an important player in your process. The keywords for this chakra include intellect, insight, and intuition. It’s associated with indigo and the light element. What Does An Out of Balance Third Eye Chakra Look Like? An out-of-balance sixth chakra can lead to a foggy, tired, and indecisive state of being. You might often feel disoriented and disconnected. If you have too much energy here, it’s likely that your mind is constantly in overdrive. If you lack energy here your tendencies may be procrastination, forgetfulness, lack of concentration, and fearfulness. It’s probably difficult for you to find focus regarding your life path. Other issues include insomnia, anxiety, and depression. Generally speaking, a blocked third eye leads to a sense of being spiritually lost and not having a clear vision of your direction in life. Those with an open and balanced third eye chakra have a clear internal vision, deep imagination, and are easily able to grasp the big picture in any given situation. You feel well-grounded in your decision making, have strong communication skills, easily remember your dreams, and your natural inclinations will be toward calmness, honesty, and compassion for all. Your intellect is well balanced with your intuition – a simple definition of what wisdom is. You find it easy to read people and understand their intentions, you know things without being able to explain how, your decision making is accurate, and others generally seek you out for advice. Those who are particularly attuned to their sixth chakra often have an expanded consciousness, able to influence non-ordinary planes of existence. 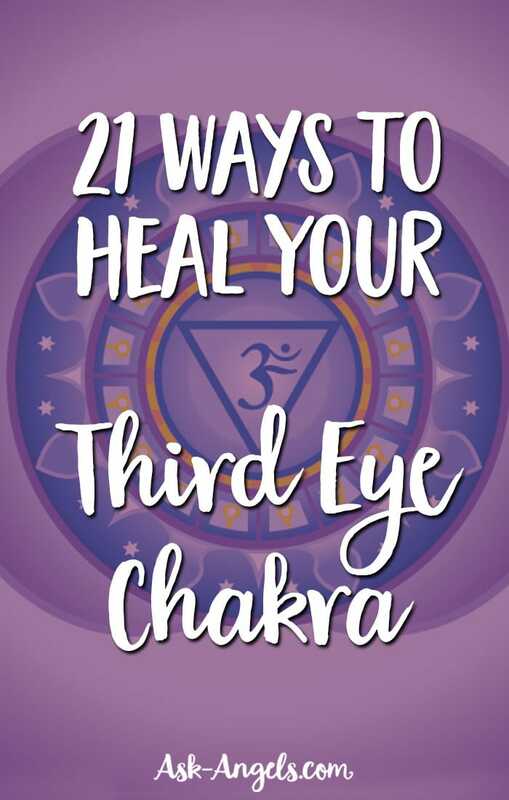 Here are 21 ways to bring third eye chakra healing into your life now. Practice dialoging with the Divine. Ask a question and then relax into waiting for a response. Remember the Divine speaks to us in messages, signs, and symbols. Be prepared to wait and be open to receiving information in any form. Keep a dream journal. Write down whatever fragments you remember first thing each morning, before putting your feet to the floor. Use essential oils like frankincense, marjoram, clary sage, juniper, vetiver, rosemary, and sandalwood. Dab some on your skin or use some in an infuser in your home or work space. These all help to cleanse and balance the third eye. Use healing stones that have the same vibrational frequency as the third eye. Good examples are purple fluorite, lapis lazuli, moonstone, amethyst, and quartz. Naturally dark blue or purple foods will have a positive effect on the third eye. Eat more plums, eggplant, cabbage, kale, blueberries, and purple peppers. Foods naturally rich in Omega-3’s (brain food) are also good. Remember to give time to balancing your entire chakra system – particularly the root chakra. An overall balanced system makes it much easy to work with one or two chakras that are particularly blocked. Find an art form that you enjoy, or think you might enjoy, and engage in it regularly. Creating art stimulates both the third eye and crown chakras. Do yoga poses that stimulate the third eye, including all forward bends, child’s pose, shoulder stand and savasana. Use guided meditation specifically aimed at opening your third eye. Check out this one with Archangel Raziel to awaken your Psychic Senses. Detoxify your pineal gland by eliminating chemicals like fluoride, alcohol, pesticides. Also, make sure you’re drinking plenty of water… And eating an abundance of dark leafy greens like spinach, chard, spirulina, and kale. Consider both acupuncture and acupressure as additions to your physical health regimens. Drop down into your body. If you feel that your mind is racing, an indication of an overactive third eye, do some grounding work and body awareness work to help calm you down. Use a mantra like ‘Eem,’ the root syllable for the sixth chakra. Connect with the element of light by finding the broadest expanse of blue sky, lying down, and then just relaxing. Find a non-competitive exercise to practice regularly. Practice opening up to your intuition by setting an intention each morning to pay attention and act on intuitive signals. Make time to be in silence and solitude on a regular, if not daily basis. Five to ten minutes a day are all that are required. Put away all electronic devices and sit or lie in silence, paying attention to internal sensations and cues. Let go of competition. Take a look at your life and assess for competitive areas or relationships, then work on releasing that competitive energy and striving for presence, collaboration, and authentic connections instead. While bringing balance and healing to your Third Eye Chakra is powerful, all of your chakras are closely connected and a part of your greater energy body. Connect with the angels to Balance All of Your Chakras and Restore Your Energy Body, by clicking here now! Are You A Healer? 16 Signs You Are!